For customers to respect a brand online and off, certain criteria must be satisfied. People need to believe and trust in a brand. The process involves a great deal of hard work and persistence but will be a rewarding experience. The 7 steps to effective web branding will highlight the necessary stages that need to be completed before a brand can reach true notoriety. 1) An Unambiguous Brand Name – To often new businesses will choose a wild and wacky name that bears no resemblance in the slightest to the market sector they’re entering. Try to create a brand name that is industry specific, a name that people will instantly associate with what it is your business does. Take care the name is not too generic or it’ll get drowned out by your competitors names, but unique enough to stand out. Try to get the domain name too as in the future this will be very helpful for Search Engine Optimisation. 2) Consistent Level of Web Branding – Try to ensure that your brand, wherever it may appear maintains a consistent style. These aspects of web branding include your overall site design, website navigation, content structure, link quality and load times. If any of these web branding aspects are lacking it will negatively influence user perception of your brand as a whole. 3) Tell an Interesting Tale – This is an important method of modern web marketing. Everyone loves a good story that they can relate to and also engage with. A story will make the user use their imagination and in doing so the brand will become much more memorable. Respect and admiration are positive by-products that your brand can take advantage of if you tell your tale well enough. 4) Listen and React – Listening to your customers couldn’t be more important. Very often, customers become part of the evolution of the company. If you allow this natural progression and actively encourage it, your brand will be held in high esteem. Feedback is vital. Another key part of effective web branding is to maintain a good online reputation. Respect others and always offer help and guidance whenever you can. 5) Simplicity - A clear business message is an understood business brand. 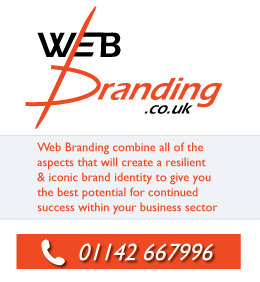 Your web branding ethos should leave no uncertainty to a passersby and if possible should invoke a call to action. 6) Bring the Brand to Life – Live and breathe the brand, scream it from the rooftops! Or via the equivalent online social media routes. Get creative in your thoughts and spark up appealing and exciting conversations. Remember the key to effective Web Branding is the creation of quality content and the more you converse across the web the more often you will stumble upon rich and engaging ideas to help boost your brand. 7) Advertise – Last but not least, for any brand to be successful, you’ve got to be notice.. Getting noticed online is an integral part to effective web branding. Consider using banner ads. The clicks through rates are nothing special and it won’t bring a massive surge of traffic to your main website but it will definitely enhance your brand notoriety. Advertise on industry related sites but not on directly competing sites. Consider using already established brands to leverage yours by association. Here concludes the 7 Steps to more meaningful and effective Web Branding, put these chapters of information together and reap the rewards of a stand out Brand.